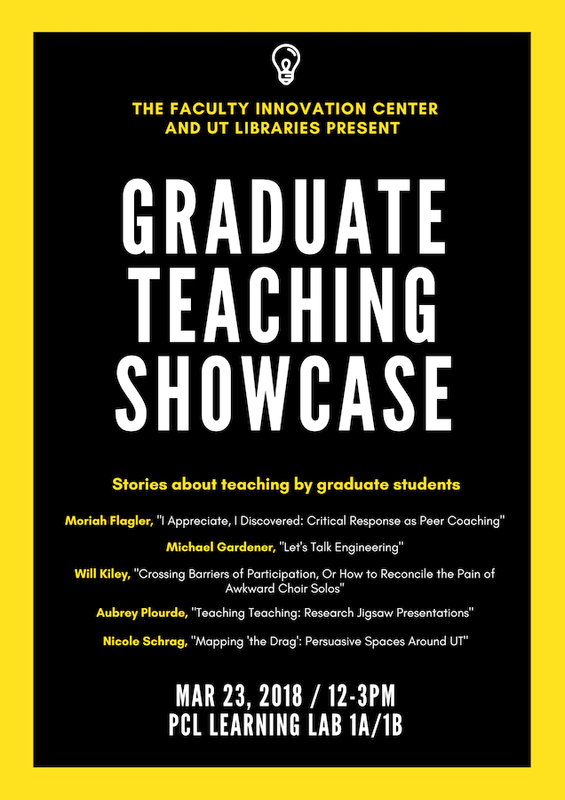 You are invited to attend the Graduate Teaching Showcase on Friday, March 23 from 12-3pm in PCL Learning Lab 1A/1B (see flyer below)! Please RSVP by Wednesday, March 14th. Enjoy some good food and hear about the interesting issues and ideas that UT graduate students are encountering as instructors at UT! Graduate students around the university competed for an opportunity to present quick and compelling talks about teaching. There will be time for interaction and discussion between each talk, and a past Graduate Teaching Showcase awardee and presenter will provide a reflection at the conclusion of the event. Lunch will be provided! Learn more and RSVP here.